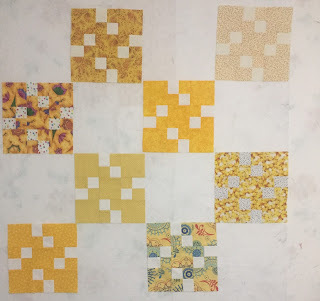 The 4 Patch/9 Patch Blocks are done for yellow. The blocks are finishing at 9", where I will need 63 blocks for twin (63" x 81"). So far, I have 29 ...34 to go. 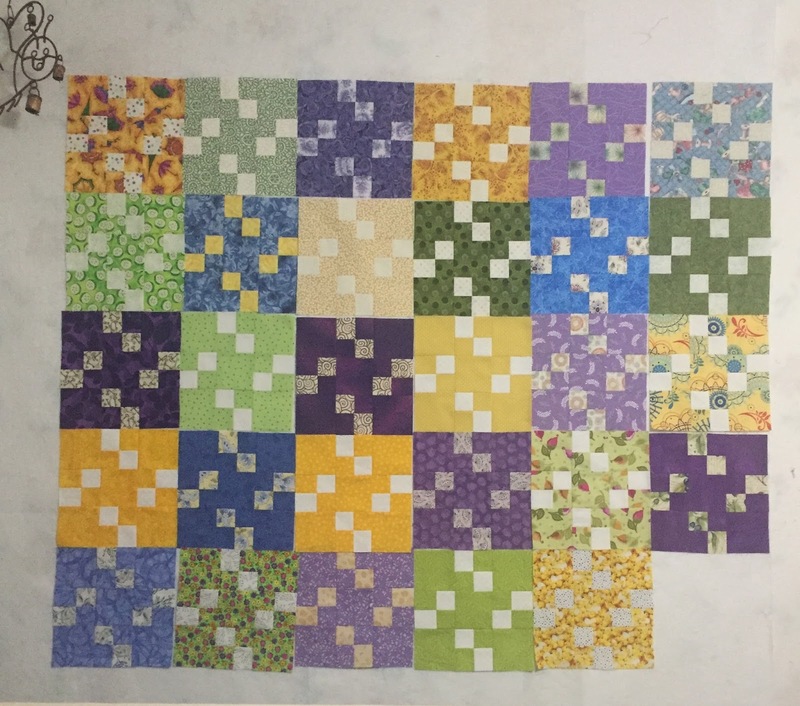 If I have extra remaining, this would be a cute baby quilt. Thank you Angela for hosting this challenge every year!!! your collection of 4 Patch/9 Patch Blocks looks fantastic so far, Jamie. Beautiful blocks! I love the way the light squares dance around over the colors. Alone those blocks don't look like much, but when you put them all together they turn into a wonderful quilt! I love how the little bits of lighter colors pop out. It makes me think of bright stars in the night sky, even if the background colors aren't quite the right color! Those blocks are sure cheery! I like how you’ve used one fabric per block. They all look so delightful together. Your RSC blocks look great all mixed up on the design wall. I look forward to seeing the added color each month. That's a new to me block. I like it! And your block colors sure play nicely together. These look great! :) It is fun to see the various projects that quilters use for RSC each year! Fun colors in your quilt. Your block are looking so good together. What a great block and it looks like its fun to make. I love how your blocks are coming together. this is a sparkly collection of blocks! Enjoy your yellow sewing ahead. What a pretty collection of blocks.